(VEN) - Corporate Social Responsibility (CSR) is an essential duty of any business organization and a philosophy that SCG adheres to business operation where it operates. SCG is determined to create social values by focusing on solving problems that directly impact people’s livelihood and quality of life. We seek to expand, replicate, and build upon what we have previously achieved in order to enhance the quality of life throughout ASEAN. This statement has essentially conveyed SCG’s spirit in CSR works. 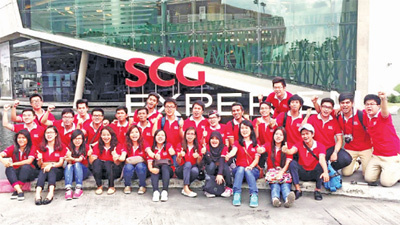 Being the ASEAN’s sustainable business leader with more than 103 year experience in doing the work, SCG has shown a bright example of how a corporate should do as a good citizen to the society where they run their businesses. Rooted in Thailand in 1913 as a cement company, nowadays, SCG has become one of the biggest conglomerates in the ASEAN region who operates in three business areas: cement building materials, packaging, and chemicals, and has a wide network of subsidiaries in many countries including Indonesia, Vietnam, Cambodia, Laos, and Myanmar. SCG is known to be a pioneer in CSR with many initiatives that greatly impact upon people’s lives. CRS activities at SCG are pided into two components. The CSR Committee for Sustainable Development supervises the first component addressing a broad social impact. The Committee provides policy and direction so that SCG can optimize the use of available resources and capability through collaboration with various fields of expertise to identify and select critical issues having impact on people’s life for designing social development project in different angles. The second component involving communities around manufacturing areas is governed by SCG Sustainable Development Committee. Work under this component draws collaboration between organization and community by combining organization’s expertise with community capacity to focus implementation on the area of green business, green community and life quality improvement of the community. 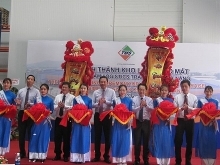 With that direction, in Vietnam during the past 20 years, besides extending business and creating jobs for more than 6,900 employees, SCG has successfully developed its CSR initiatives in many areas toward better quality of life for the people at local communities. Chiefs amongst them include SCG Sharing the Dream Scholarship, SCG Sharing The Dream Playground, SCG International Internship Program, SCG Green Dream project. The SCG Sharing the Dream scholarship program has realized 3,600 dreams of young Vietnamese. SCG deems education as basis for sustainable development. Therefore, since 1981, the company has introduced the scholarship program named SCG Sharing the Dream to support young students to pursue their educations. The project was so successful that it has been rolled out to other countries in the region including Vietnam. In 2007, SCG provided a total funding and co-operated with Tuoi Tre newspaper to implement the SCG Sharing the Dream scholarship program to outstanding and grateful hardship students in seven Southeastern provinces and Hanoi. Since then, across nine years of operation, the program has given strengths to more than 3,400 high school students. Many of them have made it to the university entrance, many have graduated and had good jobs, while others even pursued advance degree education. “I was born in a family of seven children in a small village of Binh Phuoc Province. Without a father, all burden falls onto my mother with lots of difficulties. Tuition fees were beyond our reach as we struggled to make ends meet in terms of basic necessities. I used to think of dropping off, and not to go further to universities because it could be another workload on my mother. However, with SCG Sharing the Dream scholarship, I feel more positive about the way ahead. Now that I have just been admitted to my dream university, I will try my best to go straight to my goal of becoming a good business woman to change my life and help my family” - said Hoang Ngoc Anh, a scholarship recipient who was enrolled in the Foreign Trade University in 2015. SCG builds a public playground for children in Ho Chi Minh City: For a big city like Ho Chi Minh City, lacking the public playground for children becomes a real issue of the society. With its strong expertise in construction and chemical fields, SCG has come up with an idea to develop a public playground for kids in Ho Chi Minh City, using safe materials produced by SCG Chemicals in Thailand. The playground is set right in the heart of Hoang Van Thu Park (Tan Binh District, Ho Chi Minh City). Since its opening in 2012, it has received a large number of visits during weekdays and weekends. Besides, on International Children Day annually, SCG also organizes the celebration right at the playground for underprivileged kids in Ho Chi Minh City. SCG trains university students to become the next workforce of the country, through meaningful programs such as SCG International Internship and SCG Young Leaders. SCG is offering local students opportunities to get access to the updated world-class knowledge and international working environment, which is valuable for their future career orientation. At SCG International Internship, SCG has recognized many Vietnamese talents, brought them to the regional working place in Thailand where they had a chance to coordinate with friends from other countries like Thailand, Myanmar, Indonesia, and Cambodia. There, the students would open their minds about the outside world, learn more from the company’s culture and grow up to become the pioneer force of the country. At SCG, CSR has become an important task for the whole organization. It requires a strategy in a long-term basis, and specific measurement to make sure the positive impact that will be seen not only immediately but also for next generations to come. This is written in the philosophy of the company and being implemented strictly across the organization. This sets base for a sustainable future, for the company in particular and for the whole society in general. SCG shares green practices to the community: As a leading corporate in green practice, SCG loves to share this spirit to the surrounding community. One of the outstanding projects that SCG has done in Vietnam is Green Dream project with Muc Tim newspaper. The project aims to find out and train excellent “ambassadors” to help us spread out environment practices to the community. With its well-designed program, Green Dream has trained hundreds of dynamic “seeds” who have been actively talking amongst their community about how to preserve the environment and behave in a green manner.